"Give to the one who begs from you, and do not refuse the one who would borrow from you." I confess, I have not always obeyed this command. I'm a veteran urban-dweller. 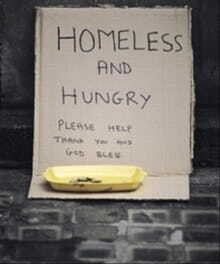 Having lived in an inner city neighborhood for 18 years, I've encountered many beggers and borrowers. Some I discerned as cons I have called out or waved off. Some I have hired to do work. Others I've given to because I felt the conviction of this text. I've thought a lot about this command of Jesus over the years. I've discussed it with many. I think I know all the major reasons why not to give when someone asks. You don't want to encourage deception. You don't want to feed a chemical addiction. You don't want to contribute to someone's cycle of poverty. And there are many others. But still this text unnerves and convicts me. The reason is that Jesus doesn't give this command in the context of addressing how I can best facilitate transformation in someone else. He is telling me how I should respond to those who are making demands on me, either from explicitly evil motives or just plain out of their difficult situation. He is telling me how I ought to respond even when being taken advantage of. Jesus is telling me to actively show kindness and radical generosity toward those who hate me or who are seeking to take advantage of me. Really, Jesus? Isn't that rewarding sinful, or at least unhealthy, behavior? Of course, I can think of Biblical examples that illustrate when it seems right to resist or flee an evil person in situations of theft, deception, abuse, persecution, war, etc. So when the Word speaks, I must listen carefully, and I must weigh all of his words. But from the words Jesus speaks here, I think it applies more often and more broadly than I want it to. He does not let me off the hook easily. He tests my heart with such radical love. And in my heart I see my selfish, unloving impulses that do not want to part with my money, possessions, time, or convenience for needy or evil people. And I have a ready arsenal of noble-sounding rationales that conceal my sin, almost from myself. What Jesus is calling me to is gospel love. It's the love that drove him to die for me with when I was still a weak, ungodly, sinful enemy of his (Romans 5:6-10). There is something about such over-the-top, radically generous love that is so different from the way the world loves that it reflects the Father's love for sinners. It's why Jesus calls us also to costly love. It is both an expression and picture of the gospel. Pray for me. I have an opportunity in my life right now to obey this command, which is why I'm wrestling with this text again. Pray that I will love the way I have been loved.